STOCKTON, Calif. - Derek Thorn dominated the NASCAR K&N Pro Series West competition at Stockton 99 Speedway on Saturday in winning the G-Oil 150. 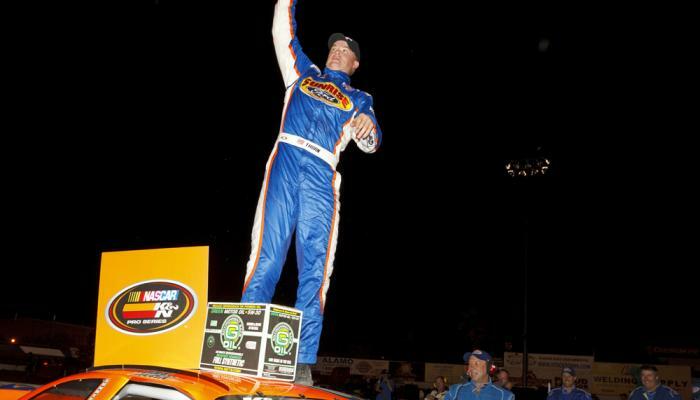 It marked the third career series win for the 27-year-old Lakeport, Calif., driver – who led all 150 laps of the race. Sergio Pena grabbed second with dive-bomb, three-wide move late in the race to get past Cameron Hayley and attempt to get the lead. It paid off for a runner-up finish, leaving Hayley with third. Luis Tyrrell, making his series debut, finished fourth, with three-time series champion Eric Holmes fifth. Thorn wrestled the initial lead from Hayley, who started on the pole, and then had to fend him off following numerous restarts. Thorn credited his team on the No. 6 Sunrise Ford/Lucas Oil/Eibach Ford with stepping up their effort this season. Sergio Pena made a late bid for the lead on eventual race winner Derek Thorn Saturday night at Stockton 99 Speedway. While Hayley challenged Thorn throughout the race, it was Pena who made the biggest charge in the closing laps. Pena, who was making just his second series start after three successful seasons competing in the NASCAR K&N Pro Series East, knew time was running out. “We just had to kind of go for it there at the end,” he said. “We made it stick with Cameron, but couldn’t get by Derek. “I had such a blast out here racing at Stockton,” Pena said. “It’s short-track racing at its best. It reminds me of racing back at Bowman Gray (Stadium), just a little more banking. Coming out here from the East to the West is a little bit different move, but they’re tough out here. Despite slipping to third late in the race, Hayley was positive about the outcome. Sixteen-year-old Hayley admitted he still needs to work on his restarts, meanwhile. The action throughout the pack increased in intensity in the final laps, with plenty of contact between various competitors as they charged to the checkered flag. When the smoke had cleared, sixth through 10th were Dallas Montes, Giles Thornton, Brett Thompson, Dylan Lupton and Greg Pursley. With the win, Thorn took the points lead over Hayley – 88 to 84. Pursley, who won the opener at Phoenix, dropped to third with 82 points. Pena is fourth with 81, followed by Thompson with 72. They are followed by Michael Self at 70, Lupton at 65, Jamie Krzysik at 64, Carl Harr at 64 and Carlos Vieira at 59. 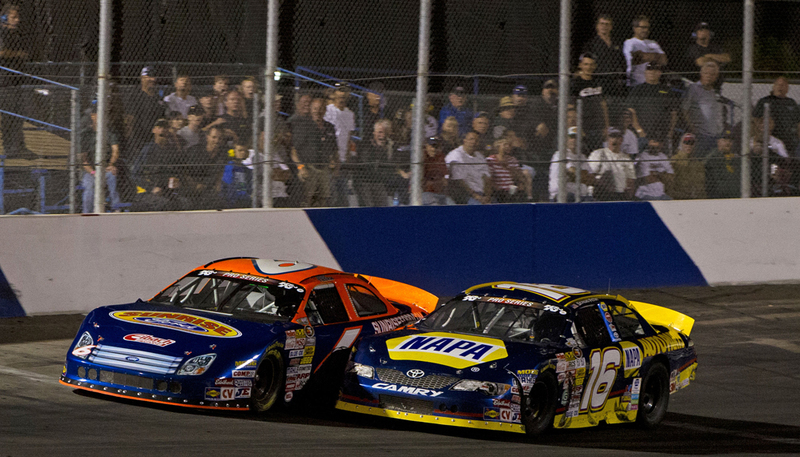 The G-Oil 150 is slated to air on SPEED on Thursday, May 16 at 3 p.m. ET. The next event on the NASCAR K&N Pro Series West schedule is at Brainerd (Minn.) International Raceway on May 25. Failed to Qualify: (6) Justin Philpott * (#47), Greg Rayl (#07), Shane Golobic * (#1), Darrell Midgley * (#81), Rich DeLong, III * (#01), Jack Sellers (#5). No. 99 spins Turn 2. ); 76-80 (Car No. 51 spins Turn 2. ); 94-99 (Car No. 61 spins Turn 2. ); 110-114 (Car No. 2 spins Turn 2.
spin Turn 4. ). 10 for 58 laps. Lap Leaders: Cameron Hayley-grid, Derek Thorn 1-150. Total Laps Led: Derek Thorn 150. 1 changes involving 1 drivers.